It is now almost impossible to avoid hearing about blockchain, Bitcoin and cryptocurrencies. However, despite the press coverage and hype around the subject, there is still very little understanding or clarity for investors. Last year Bitcoin rose 1,435%, Litecoin 5,348%, Ethereum 9,571% and Ripple a whopping 35,048%! Understandably, gains of this magnitude have attracted much attention. Some believe cryptocurrencies are the future while others are saying this could be the greatest fraud/bubble in history. Undoubtedly there are intelligent people on both sides of the argument. The aim of this article is not to take either side but to provide some explanation as to what cryptocurrencies are and how they work. Put simply, Bitcoin, Litecoin, Ethereum and Ripple etc are all cryptocurrencies or digital currencies which operate using blockchain technology. For simplicity’s sake we will concentrate on Bitcoin for the time being. Bitcoin was invented in 2009 and first featured in a white paper by Satoshi Nakamoto an anonymous author. The original idea behind Bitcoin was to remove the need for a trusted third party to process transactions and to create an electronic system based on proof rather than trust. The technology behind this payment system is called blockchain. A blockchain is a chain of records, much like a ledger, that are linked together and encrypted by cryptography so that previous entries cannot be altered. This means that, rather than transactions being verified by a third party such as a bank, they are verified by the network itself. Bitcoin is not the only application for blockchain technology. It is likely that in the near future we will see further adoption in other real-world applications. Take finance for example, blockchain’s implementation has the ability to make transactions more efficient and secure. This process could remove third parties and intermediaries from transactions possibly leading to blockchain reshaping the current financial landscape. The technology is also currently being developed to verify the authenticity of items such as designer products or concert tickets. Though the mania surrounding cryptocurrencies might pass, it looks like this could well be just the beginning for blockchain. Initially, people started buying Bitcoin so that they could transact amongst themselves without the need of a bank and at very low fees. As its popularity grew, more and more people started using the currency. Because there is a fixed amount of Bitcoin (21 million Bitcoin can be created), as more people started to use it the price people were willing to pay for it increased. During 2017 as Bitcoin gained more exposure and the price continued to rise, people started to view it as a good investment opportunity driving prices even higher. You could argue that those buying now are looking to make money, rather than using the underlying asset or because they believe in its future adoption. Much like traditional currencies, Bitcoin has no intrinsic value, people buy and sell it because they have collectively agreed that it has value. Bitcoin’s price is driven by supply and demand much like any other asset. As the supply is fixed, the demand, which is influenced by a number of factors, is the ultimate driver of price. Factors such as Bitcoin’s utility as a currency (how easy it is to use and store), the public’s perception of value and media reporting of scams, fraud and government regulation are all major influencers on demand. Many are drawing parallels between the speculation seen in the Dotcom boom of the 2000s and Bitcoin. 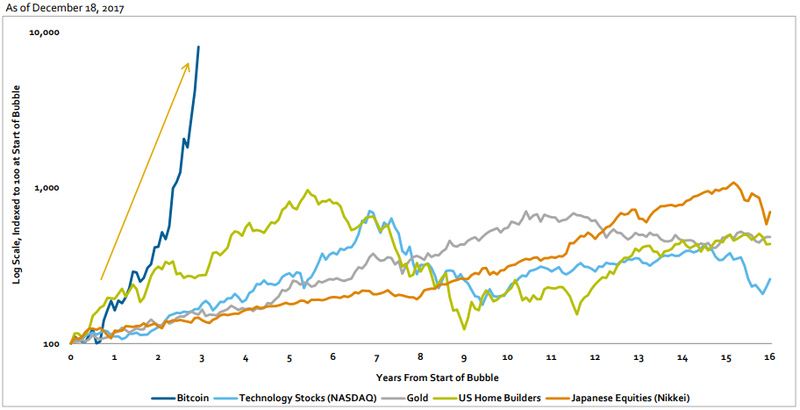 The following chart, created by Morgan Stanley, shows how unprecedented the Bitcoin ‘bubble’ is when compared to previous manias. Though Bitcoin’s exponential gain eclipses that of previous bubbles, the aftermath could play out in a similar fashion to that of the Dotcom bubble. During the 2000s many tech stocks were bid up to astronomical prices as the recently invented World Wide Web threw out traditional ways of valuing companies and people rushed in to get a piece of the action. When the bubble finally burst many lost money as companies folded and share prices plummeted, however companies such as Apple or Amazon came out the other side and have arguably changed the world we live in today. As the expression goes “history doesn’t repeat itself but it often rhymes”, with many calling cryptocurrencies the future of money, we could see a similar scenario play out as with the Technology Bubble. Who knows but maybe a chosen few will become adopted and form part of the global asset base in the future. The important point to remember is that no-one can predict which ones will survive and though some early adopters will be rewarded for the risk, many will be left scarred holding a worthless asset. Adoption of cryptocurrencies in the future is highly plausible however it is still in its infancy. Emerging economies, which are susceptible to hyper-inflation due to poor government policy and a fragile currency, might be where the major adoption of cryptocurrencies is not just driven by speculation. Populations who do not trust their government to maintain the buying power of their currency could see a cryptocurrency as a more stable and trusted form of currency which can easily be transferred around the world. Ultimately there is much speculation as to what will happen next with Bitcoin and other cryptocurrencies. We do not pretend that we can predict which way things will go; our focus and expertise lie in financial planning and wealth management not cryptocurrencies. Though these assets have created unprecedented short-term gains we believe in structuring portfolios and financial plans for long-term goals. What we do know is that these assets are still in their infancy, exhibit extreme levels of volatility, are exposed to manipulation and are not regulated. As with any speculative asset we warn clients against getting caught up in the hype and recommend only committing capital which they are willing to lose. General Disclosures: This article is based on current public information that we consider reliable, but we do not represent it is accurate or complete, and it should not be relied on as such. The information, opinions, estimates and forecasts contained herein are as of the date hereof and are subject to change without prior notification. It does not constitute a personal recommendation or take into account the particular investment objectives, financial situations, or needs of individual clients. The price and value of investments referred to in this research and the income from them may fluctuate. Past performance is not a guide to future performance, future returns are not guaranteed, and a loss of original capital may occur. Get our insights on managing your money and understanding the markets straight to your inbox. We only use this information to call you back, we won’t add you to any lists or share your information with anyone else. Taylor Money Limited is authorised and regulated by the Financial Conduct Authority FCA ref: 583300. Copyright © 2018 Taylor Money.